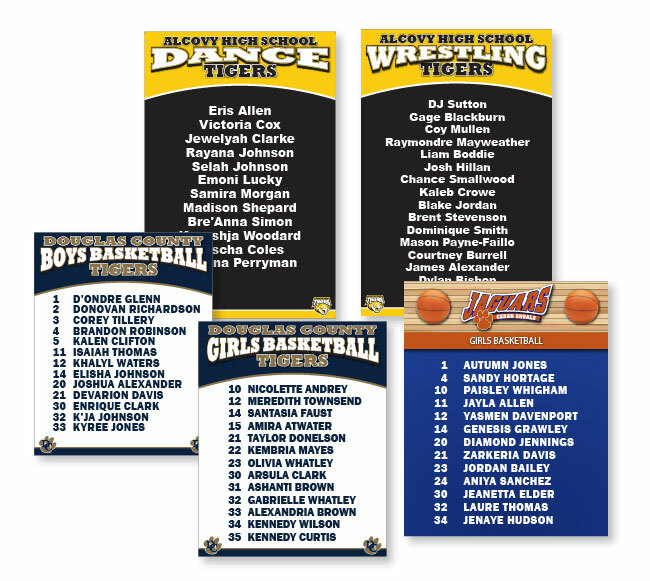 Roster Boards are a great way to enhance your team spirit and your spectators viewing experience in your gym while showcasing your athlete’s names, positions, jersey numbers and more. making it easy for spectators to keep up with who and what is going on. All Roster Boards use either vinyl decals or nameplates with brackets for easy changeability. These great-looking boards can be made in a number of different ways for indoor or outdoor use. You provide us with your team members’ names and other relevant information and we will design a custom board just for your needs!!! Roaster updates can be purchased as needed for $15.00 per line! !